What's with pitchers throwing at Ian Kinsler? 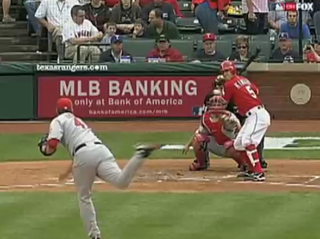 First it was Bobby Jenks' $750 high heat, and now Angels' starter John Lackey decided the Rangers' second baseman needed a good plunking. Bobby Jenks: "Yeah, I Was Throwing At That Guy"
"Evidently, he felt there was some history [between the teams] and that John was throwing at Kinsler, which was absurd." As you can tell from the video, it's completely absurd. Why would Davidson think that Lackey was trying to send a message with those two pitches? Lackey has a right to establish the inside part of the plate. And the outside part of the right batter's box.